Because globular clusters are much smaller than entire galaxies – and much more abundant – they are a much better tracer of how the fabric of space is distorted by the Coma cluster's gravity. 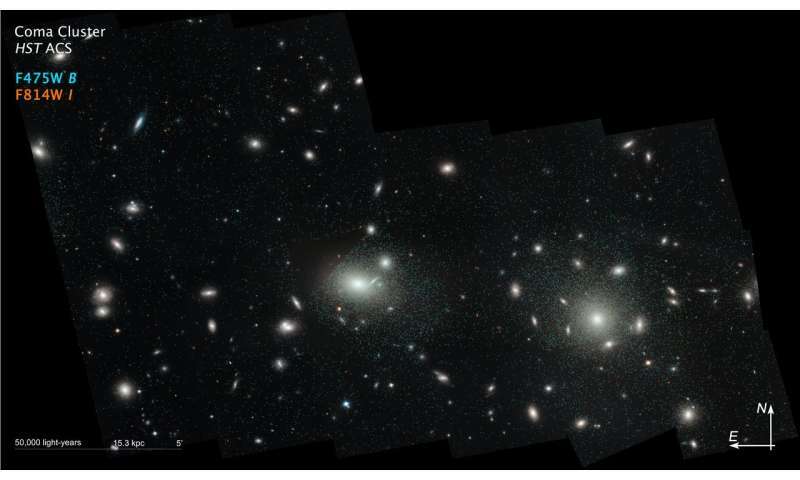 In fact, the Coma cluster is one of the first places where observed gravitational anomalies were considered to be indicative of a lot of unseen mass in the universe – later to be called "dark matter." The team developed algorithms to sift through the Coma mosaic images that contain at least 100,000 potential sources. The program used globular clusters' color (dominated by the glow of aging red stars) and spherical shape to eliminate extraneous objects – mostly background galaxies unassociated with the Coma cluster. So likely far more than the 22,000/1000 galaxies exist. And globular clusters are actually the precursors to galaxies themselves, harbor the missing intermediate black hole core stars, which periodically themselves eject newly formed matter from within that then form the new stars growing the cluster eventually into a galaxy that then diverges from the parent galaxy from where the cluster core was born itself. This is how galaxy clusters then eventually form. But this is too mind-bending the common merger maniac to consider. He doe not have the intellectual talent to see the obvious, and acknowledge the predominate observations. I say it's no coincidence those "intermediate black hole core stars, which periodically themselves eject newly formed matter from within" are, as you say, missing. They would be real easy to spot if they were there, defying the laws of physics, creating new matter and periodically vomiting it up. oh yeah, tux continues to vomit up pseudo-scientific gibberish. The "reason" he can see what no one else can see? Is that ride he took in the LGM's flying saucer. What a spectacular view!